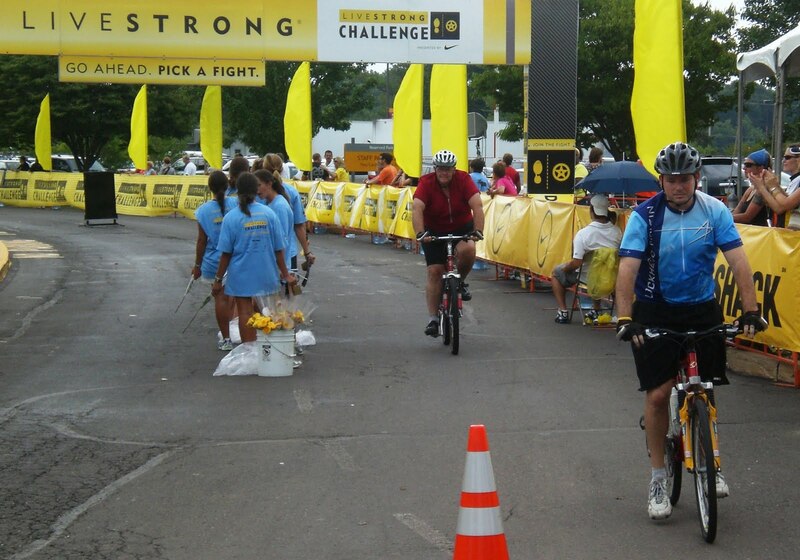 Jonathan and his Uncle Dennis raised money and rode in the LiveStrong Challenge, put on in four areas each year by the Lance Armstrong Foundation. They did the 45-mile ride (there were options of 10, 20, 45, 75, and 100), which could have been really nice if the weather cooperated. Instead, it rained almost the entire time... but at least it wasn't blazing hot! Genie and I found a great spot near the starting line to watch everyone go by, and watched intently as rider kept whirring past us. However, they never announced the 45-milers; it turns out that they were at the tail-end of the 75s, but since they never announced it, we missed them. 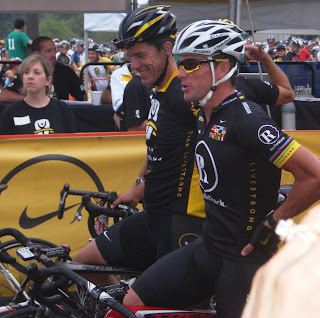 I did, however get a few good photos of Lance Armstrong, since we were only a few feet away. I also tried to get a photo of him when he returned, but they routed him a different way at the last minute and I only got the back of him. After we were sure that they had taken off, Genie and I tried to make the rounds to the freebie tents. We got through two rows and about twenty booths when the rain picked up from a sprinkle to a drizzle, and vendors began packing up. It suddenly started coming down much harder, so Genie and I took solace underneath the "food tent" for the first four hours or so. 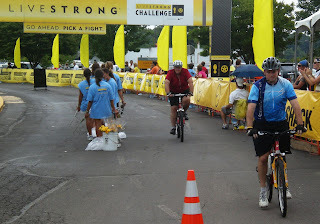 Then we went out toward the finish line, since we figured the boys might be done soon (we had been following them via Google Latitude on my phone and Jonathan's phone), since they hit halfway after about two hours. However, the rain was torrential, and we had no umbrellas. After twenty minutes and an update on Latitude, we realized they were quite far away, so we went to find dry ground. We found a small table and chairs underneath a volunteers tent, and a volunteer was nice enough to let us sit down. Before we knew it we had been recruited, handing out shirts, taking lost & found items, and giving the little general information that we knew. We also browsed the pamphlets on the area that we had on the table. Around 3pm we headed back out (the sun was starting to peek out! ), and around 3:30 they came riding across the line. The announcers were choosing random people to announce as they finished (sometimes they'd say how much was raised, sometimes they'd say the person's hometown, maybe if they're on a certain team, all sorts of random stuff), and they announced Jonathan, so it was super-easy to see him coming, despite the curves in the road! 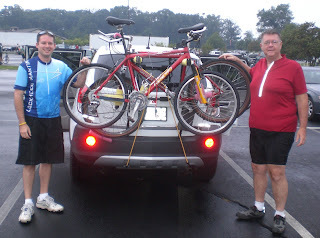 It had been a very hilly ride, but Jonathan and Dennis had a lot of fun. Too bad it downpoured most of the ride. :( They were able to see Lance Armstrong whizz by, but they didn't know he was coming in time to say anything. They'd do it all again, but they'd definitely try to raise enough money to get the dinner-with-Lance prize, hehe.